The head of the Afghan Taliban's political office in Qatar has resigned, in the latest sign of a split in the group following Mullah Omar's death. In a statement, Syed Tayyab Agha said he would step down, and criticised the way in which Mullah Omar's successor, Mullah Akhtar Mansour, had been chosen. 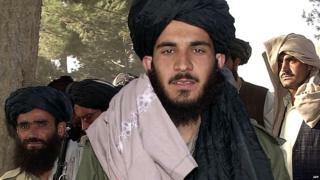 Mullah Mansour was named leader on Thursday after Mullah Omar's death was confirmed. However, some Taliban members said they had not been consulted on the decision. Tayyab Agha, who previously served as Mullah Omar's personal secretary, said he was stepping down to avoid "expected future disputes". He said it was "a great historical mistake" that the new leader had been "appointed outside the country and from the people who are residing outside the country" - a reference to claims that Mullah Mansour's appointment was influenced by circles associated with the Pakistani government. He added that the militant group should handle all its affairs from within Afghanistan, and criticised the fact that Mullah Omar's death "was kept secret for almost two years". The Afghan government says Mullah Omar died in a hospital in the Pakistani city of Karachi two years ago. The Taliban have since confirmed Mullah Omar's death, without specifying where, when or how he died. The Taliban set up an overseas office in Qatar in 2013, as part of a move to launch a political arm for the militant group, with a known address and authorised representatives who could attend talks. Tayyab Agha's resignation is the latest evidence of a divide within the militant group, with factions split over the new leadership. At least one faction would have preferred Mullah Omar's son to succeed him, and some Taliban members have said Mullah Mansour was not appointed "by all Taliban", as not all members of the Afghan Taliban's Supreme Council had been consulted over his election. Other factions of the Taliban appear to have released videos showing members pledging allegiance to Mullah Mansour, in what is seen as an attempt to bolster support for him. Confirmation of Mullah Omar's death has led to peace talks between the Afghan government and the Taliban being postponed. Pakistan had been set to host a second round of negotiations after providing a venue for talks early in July. Some Taliban figures have accused pro-Pakistani circles of imposing Mullah Mansour, who is known for his support for peace talks, on them. However, in an audio message on Saturday, Mullah Mansour dismissed peace talks as "propaganda campaigns by the enemy", and called for unity among the Taliban.